Miguel Tejada’s teammates once accused him of tipping pitches to fellow Dominicans. The evidence? 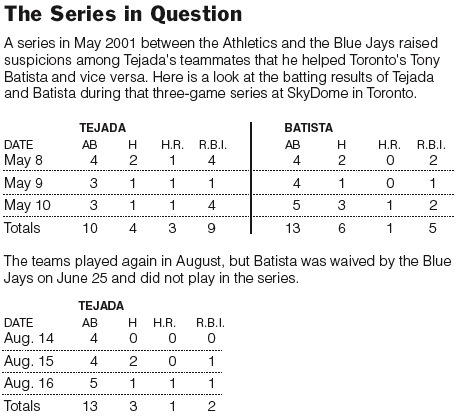 The Times said certain players started to wonder when in May 2001, Tejada and his close friend Tony Batista — then with the Blue Jays — each had a terrific three-game series. Batista was 6-for-13 with a home run and five RBIs, while Tejada was 4-for-10 with nine RBIs, including a home run in each game. The failure to understand that events occur randomly is a failure to understand causality. Monday, August 31st, 2009, by JC and is filed under "General ". Both comments and pings are currently closed. You must have never had the pleasure of watching Tony Batista hit. Six hits in three games is immediately suspicious, and I love math.